October 26, 2014 marked the day of Liquid Foundation’s grand re-opening party on Mission Beach! There were plenty of costumes, surfers and giveaways to celebrate the occasion. 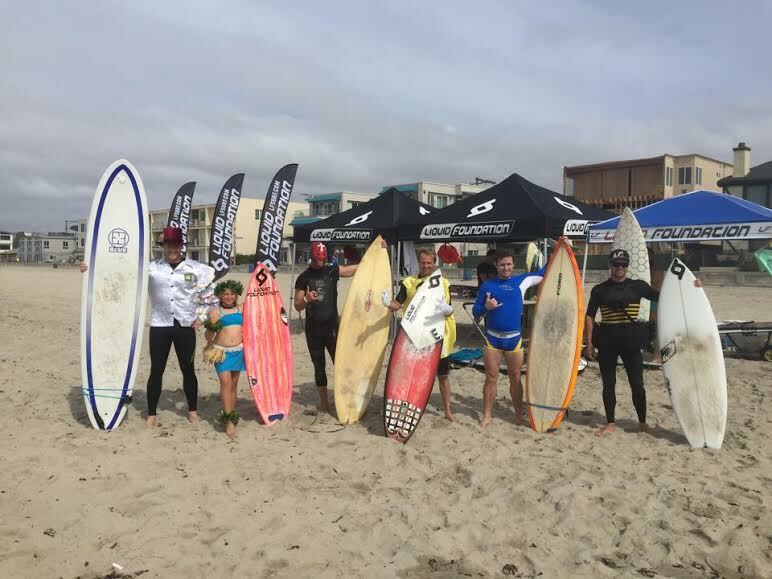 A surf advisory didn’t stop competitors of all levels from giving it their best in the surfing contest, even with the added challenge of wearing costumes! From a milkman to a hula girl to even a tutu-wearing bumblebee, participants definitely showed off their creativity with their costumes. There were several good ones, but ultimately the $40 Liquid Foundation gift certificate for Best Costume went to Tyler Coleman for his Mario costume. The winner of the Best Wave category was Mike Gordon, who received a $100 gift certificate, and last, but certainly not least, the award for Best Overall Surfing went to Ian Davis, who will receive the grand prize of a custom Liquid Foundation surfboard! In addition to the surfing action, attendees also got a sneak peak of Liquid Foundation’s new clothing line that will be debuting in spring 2015! If you missed out, be sure to stop by the shop at 3731 Mission Boulevard to check out some of these great products.